Brewster became the senior religious leader at Plymouth Colony. He also served as an advisor to Governor William Bradford. Brewster was given land on the islands of Boston Harbor. Four of those islands are named after him. In 1632, Brewster also received lands in nearby Duxbury and moved there from Plymouth Colony to build a farm. William Brewster died and was buried on 10 April 1644 at Burial Hill, Plymouth, Massachusetts. There is a memorial for him which says it is in honor of "Elder William Brewster Patriarch (father) of the Pilgrims and their Ruling Elder 1609–1644". The burial place of his wife Mary is unknown. ↑ 1.0 1.1 1.2 1.3 1.4 1.5 1.6 1.7 1.8 Philbrick, Nathaniel (2006). Mayflower: A story of courage, community and war. New York: Viking. ↑ Merrick, Barbara Lambert (2000 3rd edition). William Brewster of the Mayflower and his descendants for four generations. General Society of Mayflower Descendants. ↑ "A genealogical profile of William Brewster". pdf.js. 2011. http://www.plimoth.org/media/pdf/brewster_william.pdf. Retrieved 14 June 2013. ↑ 4.0 4.1 4.2 "William Brewster" in the 1911 Encyclopædia Britannica. ↑ Stratton, Eugen Aubrey (1986). Plymouth Colony: Its history and people, 1620–1691. Salt Lake City, UT: Ancestry Publishing. pp. 413. ↑ Bowman, George Ernest (1920). 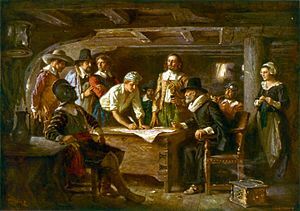 The Mayflower Compact and its signers. Boston: Massachussetts Society of Mayflower Descendants. ↑ Steele, Ashbel (1857). Chief of the Pilgrims: or the life and time of William Brewster, ruling elder of the Pilgrim company that founded New Plymouth, the parent colony of New England in 1620. J. B. Lippincott. pp. 353. This page was last changed on 22 July 2013, at 16:51.